There is no way to know of the dangers that may be ahead of you during daily transport. An accident on the way to work or on the way home from a recreational visit can break or damage the glass on your vehicle. You do not have to call a tow truck when these unfortunate events happen to you. PG Moorpark auto glass repair services the local area and provides professional mobile glass repair services. No one expects to come out of a supermarket or shopping center to find window damage on his or her car or truck. It is common for hit and run accidents to happen in public places and filing a police report for damage does not fix your windows. Some insurers do not even cover glass damages. 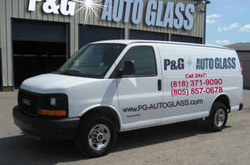 PG auto glass repair in Moorpark comes directly to you to swiftly fix unexpected damage. There are many reasons to avoid driving in bad weather, but sometimes the reasons to drive are necessary. Strong winds and hail are known to cause destruction to houses and other structures and your automobile is no different. The windows on your car are strong, but can still be damaged so severely that they must be replaced. PG Moorpark auto glass repair provides 24/7 replacement services. Residential vehicles and commercial vehicles both share the same requirements for daily transportation. The difference is that businesses can be disrupted due to the slightest delay. This shortage of time can affect the local economy. Owners of school buses, city work trucks, courier services and airport shuttle buses rely on PG auto glass repair in Moorpark for lifetime guarantee installations. Vandalism is still one of the contributors to broken or damaged windows to vehicles statewide. Discovering that your automobile glass has been damaged late at night is stressful when you need your car for transportation in the morning. PG Moorpark auto glass replacement technicians respond fast to reports of damage and perform the work expertly and compassionately. Treating your emergency like a real emergency is one more reason locals select PG auto glass replacement in Moorpark. Do you need a service for repairing and replacing auto glass in Moorpark, CA in zip codes 93020 or 93021? You can contact PG Auto Glass for all your repair and replacement needs.